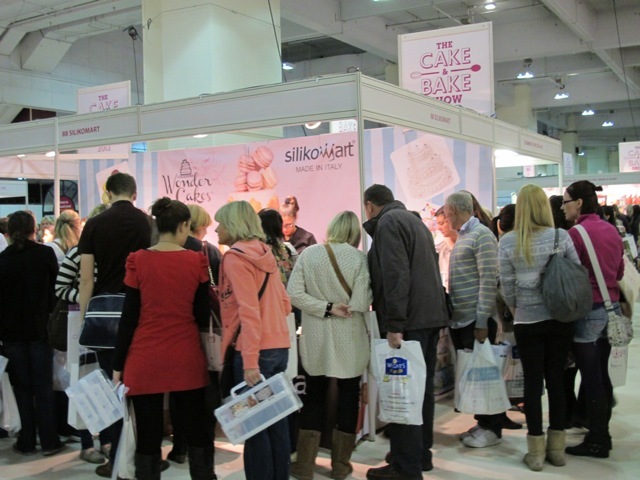 The eagerly anticipated Cake and Bake Show took place at London Earls Court this weekend. With show tickets long sold out, January sale style queues of enthusiastic baking fans staked their place to get inside. 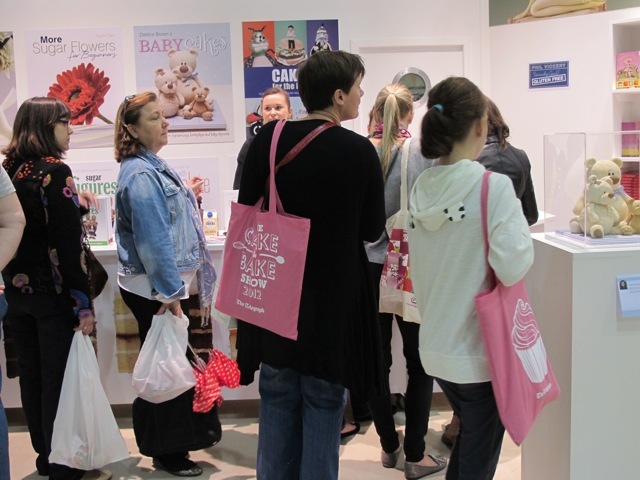 Billed as the first live event dedicated to cakes, breads and the art of baking, visitors were surprised to find more than a sprinkling of sugarcraft brands dominating the exhibition stands. As well as the demos people go to these shows for the shopping. Purchasing opportunities for bread and pastry makers proved far fewer than for piping bag princesses and cupcake connoisseurs. On paper, The Cake and Bake Show should be a more mainstream day out than the longer established “Cake International” sugarcraft show. Headline acts of Great British Bake Off judges Mary Berry and Paul Hollywood were supported by names including Baking Mad’s Eric Lanlard, pastry guru Richard Bertinet and Fabulous Baker Brothers’ Tom Herbert. Baking and cake decoration are two different disciplines, you’d not expect to attend a knitting fair and discover it full of specialist embroidery. Amidst the sugary backdrop there were also some sticky organisational situations arising. The Cake and Bake Show Facebook wall tells a tale of frustrated exhibition goers queuing thirty minutes or more to spend their dough at limited selection of food sellers (and indeed a penny in the ladies). Others who had paid money on “classes” were disappointed to discover they’d signed up to seated demonstrations that were just as easily watched for free by people standing behind. People bagged seats 90 minutes in advance for the slot to watch Mary Berry. Many left earlier than planned with legs crossed and stomachs rumbling. Like Westfield on a Saturday in December, getting everything you wanted out of The Cake and Bake Show was possible but exhausting. Earls Court 2 is a hideous venue (soon due to be knocked down) and the exhibition hall was laid out in a baffling triangular layout. Difficult to navigate, many stalls were easily missed. Pinch points felt like Holborn tube station on a Monday morning. 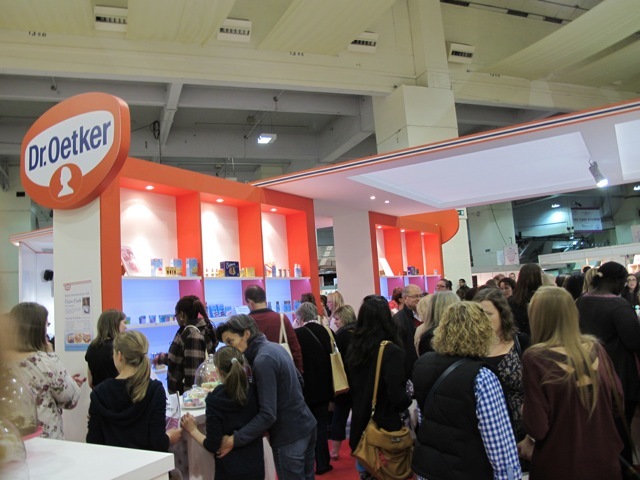 The Cake and Bake Show will return in Manchester, April 2013. Follow my tips below to be prepared. Wear thin layers of clothing as if shopping in the sales. Keep your hands free by carrying a light weight ruck sack. I recommend the ultralight foldaway rucksack by Flylites. Withdraw cash from an ATM before you get anywhere near the venue. Many stalls may not take card payments below a certain spend. Fill your tum and empty your bladder before going inside. Take your own water bottle but don’t drink it until you’re about to leave. Research the programme in advance and decide which sessions you’d most like to see. Coincide waiting for these to start with eating your packed lunch. Avoid weighing yourself down with purchases too early. Scout around deciding what you’ll come back and buy later. Don’t be someone lugging around a giant plastic cupcake box unless you’re on your way to the exit. Haggle stall holders for better prices, especially if you’re buying any items in bulk towards the end of the show. Did you go the The Cake and Bake show? How was it for you? My experience was pretty similar to yours, My other tip would be to skip the demonstrations and use that time to head for some of the stalls. I was able to do a fairly quick circuit while Mary Berry was on stage and that wouldn’t have been possible once it was over and done with. I also would have liked more about actual baking; I know I’m not the only person who isn’t that interested in decorating and sugar craft. I think it was struggling somewhat to find its market but hopefully it will just get better from here on! We were there on the Saturday and encountered the same problems as you. We had a great day out but I was disappointed at the lack of baking stands, there were a silly amount of cupcake cases on sale. Luckily I didn’t book and pay for a class but I would have been pretty miffed if I had and found I didn’t need to. I’ll be heading to the Manchester one as it’s closer and will be interesting to compare the shows. I too had a very similar experience, and was one if those very dissapointed people who booked a “class” only to find out I’d booked a seat to watch a demonstration that could easily be watched by the side of the “VIP” area. I’ll be writing my own review ofte show shortly, and I can assure you it won’t be glowing. I would agree with all of your comments above, considering it was a cake and bake there wasn’t hardly any edible products to taste or buy. I too was surprised that there was so many cupcake cases for sale. hopefully the venue for next year will be so much better, how can you be at a show that focuses on food and have so bad food venues, that ran out of sandwiches?! and so little seating or bins?! Totally agree with you. I expected it to be busy, which it was (and the amount of people on the tube with large bags heading out of Earl’s Court station prepared me) but I thought that there was way too much sugarcraft and not enough baking. I was hoping to have been inspired by some new baking trend or piece of equipment but I wasn’t and it was just very same same. I also bought tickets (for both me and my mum) for three class rooms and we were quite miffed that people on the sides could actually watch and see better than us (as we were stuck at the back). Hopefully it will improve year on year! Hear, hear. I was there on Saturday and agree with all of your advice. An amazing adventure ( I travelled down from Sunderland) but a tad disappointing for all of the above reasons. Your blog is fair and concise, and well put. Well done. It’s really interesting to what others thought of the show – can easily see how some people would not enjoy the show (queues and lack of food aside) just because of the strong emphasis on sugarcraft. I mentioned it in my post, but I think I was lucky that I went at the right time (crowd wasn’t too bad at all, and it was in between mealtimes), and have a keen interest in decorating anyway. We stayed quite a long time at the show on Saturday (from 10:30 to 6:30) and the evening was much better as the crowd had gone. We could finally access to the stalls. I’d give anyone the same tips as yours ; especially the one regarding the lunch! Totally agree with your comments. Too much cake and not enough bake. It was great to have a dedicated Real Bread stage but next time I hope, there will be more bread and bread baking “kit”. We left it a bit late to book tickets so only managed to get tickets for saturday 5pm-9pm,we got there at 4 .45 to quite a long queue, but got in quickly,the first stalls seemed to be over whelmed but the crowds opened out over the first hour. Because there was so much of interest being bread bakers and cake decorators, we enjoyed the show, paying only £10 each for our tickets helped. We did however nearly miss the section of the show up past the kids kitchen, partly because we didn’t actually read the show guide until we were on the train home, as there was too much else going on. We didn’t have our evening meal until we got home at 10pm, as food at the show was limited. Very interesting reading this Sarah. I was unable to make it and was really disappointed to be missing out. Not sure I really did though, given what other people have said. I would not have gone there to shop, rather, to watch demos. I will be very interested to read other reviews too will be visiting Andrea’s blog soon! Dear Maison Cupcake….I just came across your very opinionated blog…especially this post on Cake & Bake Show (i’m a big fan, thought it was a fab event, although I’ll agree it was a little overcrowded! )…Interesting that Cake International – from what I’ve heard – traditionally a cake decorating event, is now starring Mary Berry and is offering ‘bakery demonstrations’ at its shows this year? They obviously don’t share your view that cake decorating and baking should not be mixed under one roof….As different as knitting and specialist embroidery, you say? Perhaps you should also share your infinite wisdom with the organisers of the ‘Knitting and Stitching Show’…held three times a year up and down the country, what are they thinking?